"The gloomy days will soon be over. I shall soon liberate myself from this onerous responsibility. I shall no longer be a shepherd. I have spent over 6 decades with sheep, rearing them, monitoring them, and nurturing them. They walk at my voice, they follow me and I understand every bit of them. My daily routine has been structured around them for the last six decades. 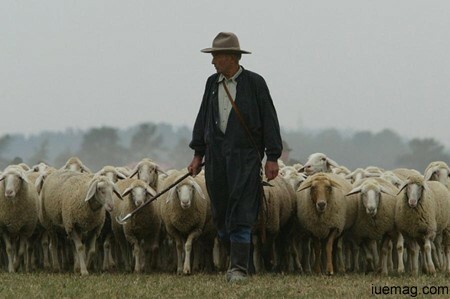 When I was young, we had a large community of shepherds. Everyone was earning and happy. I used to visit Bikaner's wool Mandi - which was the Asia's largest wool market at that time. There were a large number of traders, who used to give us some advance money and get their wool booked. We were proud because we used to supply Chokhla wool, the finest and the best Indian wool for carpet weaving. The wool that we used to supply used to be processed, converted into woolen yarn and then taken by carpet weavers, who used to fabricate fine carpets. Chokhla wool is considered the best wool for carpet making. What am I talking? I am just ruminating. These were all great golden days. These days are not possible now. Coming back to today, nobody in my family is shepherd except me. My sons and grandsons have adopted masonry. They prefer to work as daily wage earners. They shun my profession. They ask me, "What do I earn out of this?" They openly challenge me for my foolish decision. I was little emotional. I wanted to be with my sheep. But now, I have decided to change. I will also become a daily wage earner. I shall also go to the village to earn as a Narega worker. The world has completely changed since my childhood. People say that it's development. There are huge buildings, huge roads, and huge construction work all around. Everyone has progressed. Those who used to walk earlier, now show off big-big cars. Everyone in my community has become a service class person and those who got the government jobs, are the most fortunate. They earn a lot and enjoy a lot. They were born with fortunes. However, there are some misfortunates also like me, who continue in the old professions. Profession after profession is dying. My neighbour also closed his profession. He used to make earthen pots, but he successfully got his son into government as a Babu and now he is very rich. Whatever I knew, I tried to teach my son, but he curses me for all that. He repents that had he studied in some school, he would also have become a Babu. I couldn't do that for him. I knew how to use my Charkha, which is now dilapidated; nobody uses it. I knew how to weave a carpet - but nobody does it now. I knew how to prepare woolen yarn, but large machines do it now. I knew how to cure my sheep, but this is the last time I will be using this skill. I knew how to rear sheep, but nobody needs it now. I knew how to extract balm from the milk of the sheep and some herbs, but it's of no use as nobody pays for it. I knew how to use the herbs for small injury and other treatments, but who will give me money for that? This Pagdi, this Dhoti and this Kurta that you find me wearing, have over-lived their lives. I haven't been able to buy a new dress for the last four years; what to talk about anything else? In the last season I barely earned Rs. 15000. Long back, a professor by name Sunil Ray had come down. He was trying to arrange some free medical dispensaries and some other support. Thereafter some other social workers also came and asked about my plight. They consoled me. Someone asked me about my daily routine and was surprised to know that I start my work as early as 4 am. They asked me about the quality of roads and development in my village. I told them that the roads are good, but there are no roads for pedestrians. Where do we walk? Police rebukes me for moving through the national highway. How do I take my sheep to far off places during winter when there is no greenery left here? I am sixty five now, but I am still strong enough to work as a daily wage earner, and I shall earn enough to feed myself. I will kill the shepherd in me. I shall sell out all my sheep and be a free soul for the rest of my life." Any facts, figures or references stated here are made by the author & don't reflect the endorsement of iU at all times unless otherwise drafted by official staff at iU. This article was first published here on 21st March 2014.